What would you do if, out of the blue, a billionaire industrialist decided to make you the CEO of his company? No prior business experience necessary. There is only one catch: you need to pass seven tests from the 'textbook of life'. This is the offer made to Sapna Sinha, an ordinary salesgirl in an electronics boutique in downtown Delhi, by Vinay Mohan Acharya, one of India's richest men. Thus begins the most challenging journey of Sapna's life, one that will test her character, her courage and her capabilities. Along the way she encounters a host of memorable personalities, from a vain Bollywood superstar to a kleptomaniac Gandhian. At stake is a business empire worth ten billion dollars, and the future she has always dreamt of. But are the seven tests for real or is Acharya playing a deeper game, one driven by a perverse fantasy? From the acclaimed author of Slumdog Millionaire, one of the biggest films of the decade, comes this compelling, suspenseful tale of the power of dreams, the lure of money and the universal need to know who we are. 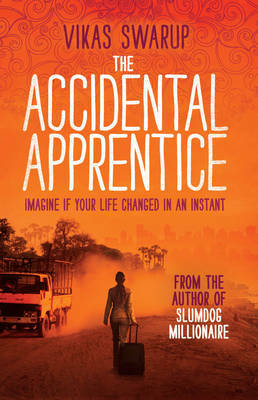 I must first confess that I’ve never read anything by this author before nor have I seen the film, Slumdog Millionaire. "I want to make you my CEO."